WASHINGTON His feet soaking in a tub of ice, his eyes scanning a box score, LeBron James chuckled a bit at the notion that his Miami Heat might learn something from a surprising setback against the Washington Wizards. "Nah, man, there's not no lesson. This ain't a lesson for us. We just lost," James explained. "We've seen and been through everything, so we don't need a loss to be like, `Oh, let's catch ourselves.' It happens." Not too many people figured this outcome would happen, though, a message Wizards coach Randy Wittman delivered to his players before their worst-in-the-NBA team went out and beat the Heat 105-101 on Tuesday night behind Jordan Crawford's 22 points  and despite James' triple-double of 26 points, 13 rebounds and 11 assists. Perhaps inspired by the courtside presence of Washington Redskins rookie quarterback Robert Griffin III, who exchanged a handshake with Cowboys fan James after the final buzzer, the Wizards doubled their victory total this season. The Wizards improved to 2-13, earning their second win in the past three games after starting a franchise-worst 0-12. "I'm so happy for those guys," said Wittman, who called this perhaps the most satisfying victory of his coaching career. He said he told his team beforehand: "The only people that think you have a chance tonight are the people here in this room. ... We need to have a statement game." And, Wittman continued, "I said, `I've seen it a number of times, guys.' ... (People say), `They ain't got a chance to win this game.' And that's what people were saying. We all listen. Could hear it on the street and all that. These guys, it bothers them." 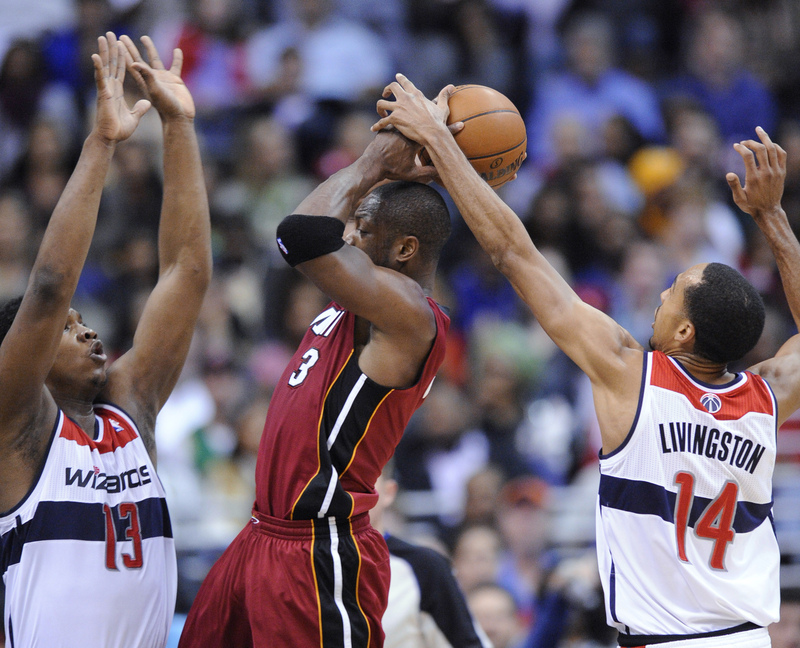 The reigning NBA champion Heat's six-game winning streak ended, and they fell to 12-4. "You move on," said Dwyane Wade, who scored 24 for Miami. "You learn from it, but you don't become a good team by holding onto certain losses  or certain wins." The Wizards -- ranked dead last in CBSSports.com's power rankings -- don't defeat many teams, but they defeat the Heat: This made it three consecutive regular-season victories for Washington over Miami, including two last season in April. "It's a big momentum win for us, obviously. We've been struggling to put together four quarters," Washington point guard Shaun Livingston said. The Heat were the ones rushing shots on occasion and they made only 8 of 28 attempts on 3-pointers. The Wizards, surprisingly, were the ones being patient, making the extra pass, finding the teammate with an open look  and finishing with 31 assists on 38 baskets. With a crowd of 17,761  not, incidentally, a sellout  standing and screaming down the stretch, relishing that rare chance to witness a compelling game, Kevin Seraphin contributed 16 points and 10 rebounds for the hosts, Crawford made three free throws in the final 11 seconds, and James missed a potentially tying 3-pointer with 3.9 to go. After trailing by as many as 12, Miami tied the game at 88 on Bosh's reverse layup with 6 minutes, 50 seconds left. But Crawford's 15-footer put Washington ahead 99-95 with a little more than 2½ minutes remaining. With 18 seconds left, James wasted a chance to give the Heat the lead, clanking a 3-point attempt. Crawford's free throw then made it 102-99, and he slapped his palms together vociferously. James made a shot in the lane to pull within 102-101, and Crawford added two free throws for a 104-101 edge with 6.9 seconds on the clock. James then missed his last shot, another 3. Nene got the rebound, and tacked on a free throw. Unlike the James-Wade-Bosh Heat, the Wizards are mostly a collection of castoffs and high draft picks who never lived up to their billing  or have yet to, anyway. Their best player, 2010 No. 1 overall pick John Wall, has yet to participate in a practice, let alone play, this season because of a left knee cap injury.